15/06/16 – Case now fully closed thanks to Jon Harrison. Game never existed, it was a fake! Beavers was another promising title which Grandslam were entrusted to publish on various systems. 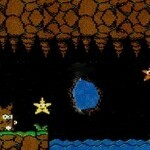 You had to control “Jethro the beaver” through 4 valleys, each with 4 levels. From the previews in the magazines, the game looked a very nice multi-directional platformer. Very colourful graphics, you could almost feel the great little game emerging. 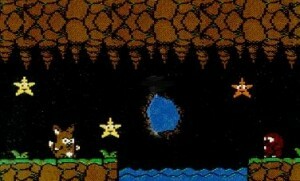 The magazines described the animation as “superb”, with many nice little touches, such as Jethro getting bored, and then going to sleep if you leave him too long. Commodore Format even proclaimed that the game could finally be what Sonic fans were waiting for. Unfortunately nothing happened, and the game never surfaced. The Amiga version did, and received respectable marks in the 70% range. The crew behind the game was originally traced to Arc Developments, and there was a lot of confusion over the existence of the C64 conversion. Richard Underhill could not remember the C64 production, and gave the possibility that either the game shots were mock ups or Grandslam had someone else doing the C64 conversion (The later being unlikely). Reviewers at both top UK magazines reported on the quality of animation and gameplay, so the first seems unlikey. So what has happened? Well, it can now be confirmed that the game shots were actually “FAKE”. That’s right, an ex-employee of Grandslam, Steve Sargent has confirmed that the screenshots were generated on the Amiga or PC to generate publicity for the game. The fakes were confirmed by Jon Harrison as well, who remembers making all the screenshots up on an Amiga. Richard Underhill however developed a small demo which would scroll the level graphics, that were quickly ported over to a C64. It just pretty much showed the level map, with no interaction and some bubbles floating over the top. What little was produced was maxing out the memory (probably due to how the graphics were being pulled in). It was developed as a way of keeping Grandslam happy when they visited – making it seem like progress was being made whilst they were busy trying to finish the Amiga/ST versions first. It is possible that the C64 version would have been developed later, but by the time Beavers was finished on the 16-bits and Nick Faldo + Liverpool was done, the relationship broke down with Grandslam and it was never properly started. Shame on Commodore Format and Commodore Power for proclaiming this “Excellent” conversion you say?… Well, unfortunately publicity has shown its ugly face on many occasions, and this sadly is just another moment. Who knows what may have been, what with Arc Developments producing some star quality for Grandslam in their final years, this could have been a golden final curtain. ‘Liverpool FC’ now takes that acclaim. Extinction for this C64 Beaver… Case closed! 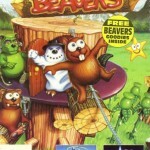 Beavers was an original concept by Arc and was primarily developed for Amiga / ST and PC! It was the creation of Artist Jon Harrison – who later moved to NMS up the road and Julian Scott was the main programmer behind the Amiga/ST versions. I tell you that their record of paying for development milestones was atrocious. We parted company after a long legal wrangle….not particularly damaging to Arc, but to Grandslam. We had a number of C64 programmers that came and went – I can remember four (only one was worth of note), but either Chris or myself ended up finishing (without respect to quality) them, but none worked on Beavers. “I used to work for Grandslam at the time they were developing “Beavers” (nice to see Rich Underhill is still working in the biz – he’s a nice guy 🙂 I was Assistant Producer on the titles that Arc did including Liverpool, Nick Faldo and Beavers. As far as I can remember Beavers never existed on the C64. The screen you have on your site is just a mock up. The original intention was to make it but I think it was dropped due to a combination of the decline in the C64 market, the financial issues that Rich mentions in his interview and the ability of Arc to find someone to actual write it. I don’t think anyone was assigned to do a C64 version as the guys at Arc who COULD do a C64 version were probably assigned to something else (or didn’t want to do it). There was Rich himself, the guy who did Nick Faldo c64 (Neil Paterson?) and one of the Coupe brothers who ended up writing the C64 version of Liverpool. I know we had loads of trouble getting the Amiga version of Beavers done and the C64 version of Liverpool done. This was mostly due (I believe) to the money problems between Arc and Grandslam and partially due to the fact that there were bigger fish to fry than C64 versions of games at the time for Arc. The C64 was really on its last legs as a commercially viable platform at the time. Certainly, it may have been discussed that someone else do the C64 version of Beavers (this happened with but as far as I recall no work was actually started at Arc or anywhere else).